Think Burrus Blog: Why Did we See Less Adult Rootworm Beetle Pressure in 2015? Why Did we See Less Adult Rootworm Beetle Pressure in 2015? 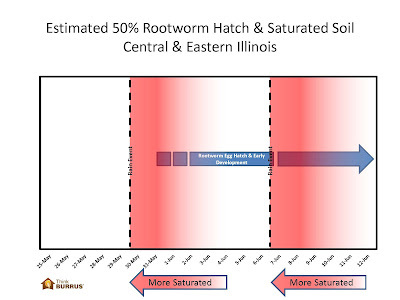 Rootworm larvae need to breathe and our saturated soil kept them from doing so. The cells of young rootworm larvae initiate a mechanism that allows them to briefly survive when oxygen is low. During this process, lactic acid is produced as a waste product. This process is acceptable as long as lactic acid does not reach a critical level. For the rootworm, more than one day of lactic acid accumulation results in death. The charts below show that rootworms were repeatedly deprived of oxygen this season. They were exposed to a very lethal insecticide – their own lactic acid. What else about 2015 resulted in decreased field to field rootworm numbers? Once again, rainfall is the answer and it impacted every stage of the rootworm lifecycle. Sometimes that impact resulted in a very direct rootworm decrease. Sometimes that impact was more indirect. Rootworm eggs sit in the soil, overwinter there, and hatch the next growing season. By their nature, rootworm eggs are pretty hardy when it comes to moisture. They actually need a little soil moisture to survive and seldom suffocate to death. However, this changes when waterlogged conditions are accompanied by cool weather. Put those two together and egg mortality spikes. The early to middle part of the growing season was unseasonably cool and wet. 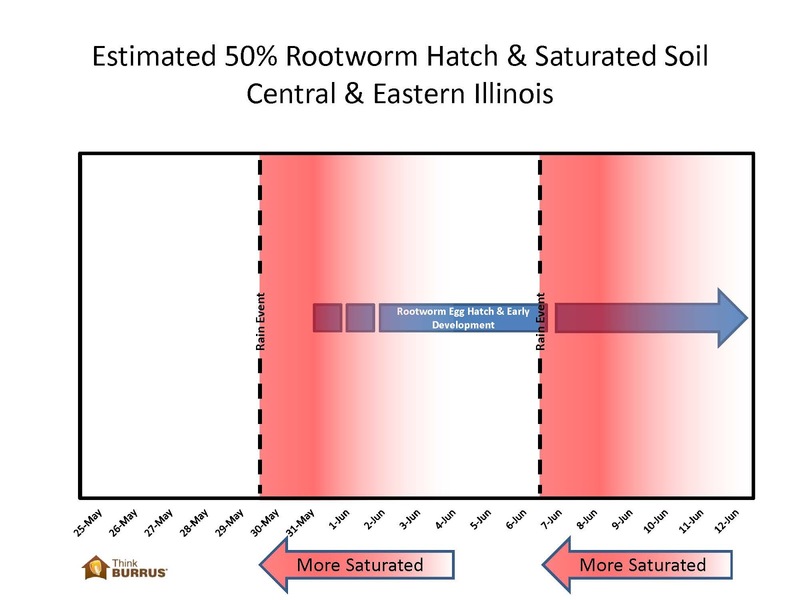 While resulting egg mortality is not the primary explanation for decreased pressure this season – it did contribute (ever so slightly) to decreased rootworm numbers. 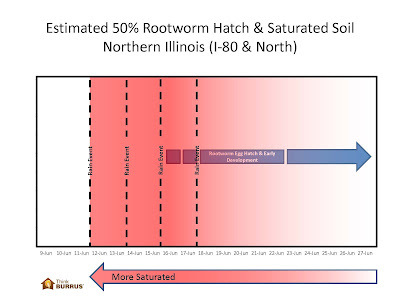 We already noted that rootworm larvae do “suffocate to death” when subjected to saturated soil. However, excess soil moisture still impacts those larvae that successfully stumble through wet soil. Larvae need to find roots, need a pathway to roots, and need adequate roots to graze upon when they get there. 2015 exploited each of those vulnerabilities. Rootworm larvae rely upon carbon dioxide and chemicals released by corn roots to hone in on those roots. This material must filter through soil pores to larvae. Only then can larvae detect those gases and progress toward the host root material. However, when soil pores are full of water – these gases can’t get to rootworms. Survivors literally cannot detect where the roots are. Survivors run an increased chance of starving to death. Rootworms do not really “burrow” through the soil. Instead, they crawl through soil pores to reach their host. 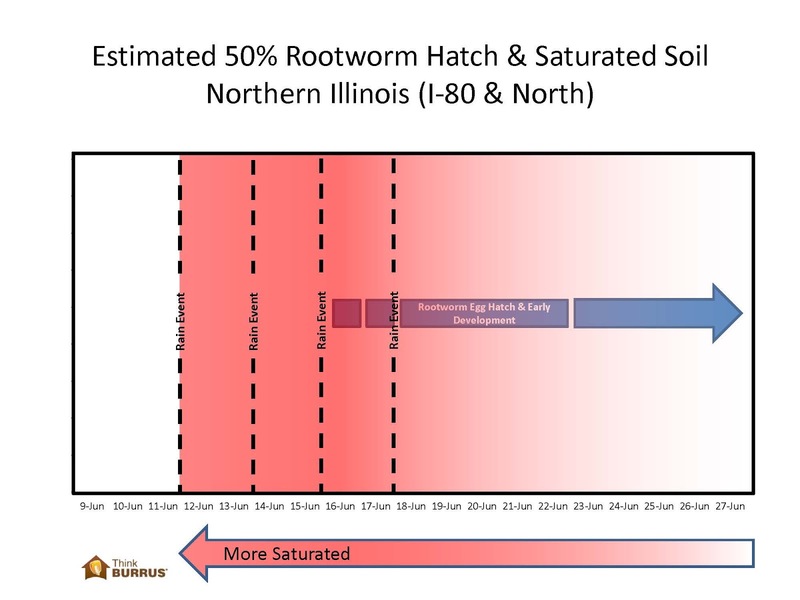 Saturation literally clogs the small holes/ highways used by rootworms to reach roots. Finally, on a more indirect level, saturated soil results in very shallow/skimpy root systems. During 2015, there was literally less root material distributed throughout the soil profile. If rootworm larvae somehow found a way to survive and found a way to reach corn roots, there often was a pretty thin feast waiting for them.